Characterized by a nuanced depth & complexity of yuzu flavor as well as an exquisite yuzu fruit bouquet. The first yuzu fruit we received for brewing many years ago came from a lone yuzu tree in the lovely local Kiyokawa Temple garden. The label is an abstract rendition of the Kiyokawa-Dera garden. Yuzu is a Japanese citron fruit the aroma of which is gorgeously spicy and the flavor lemon-like tart. 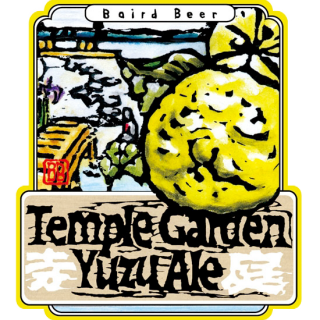 This sprite, snappy Ale is fruited with yuzu and hopped in a complementary way. Small additions of rye and oats to the malt grist help accentuate the piquant and aromatic character of the yuzu fruit. We add the fresh fruit in two forms (as peel shavings and as freshly squeezed juice) and at two separate stages (one at wort production before primary fermentation and one during beer maturation before packaging and secondary fermentation). Thus, we achieve a nuanced depth and complexity of yuzu flavor as well an exquisite yuzu fruit bouquet.